Ray Harryhausen destroyed Washington D.C. via an invasion of flying saucers. He caused havoc in Rome via the rampaging creature Ymir of 20 Million Miles to Earth, and demolished the Coney Island roller coaster in The Beast From 20,000 Fathoms. And with great pride in his voice Harryhausen gloated that he pulled down San Francisco's Golden Gate Bridge via his infamous sextopus! But after destroying so many cities, and with the Japanese jumping on the bandwagon laying waste to Tokyo via one Godzilla or another, Harryhausen decided he wanted to try something different. He set aside destroying the cities of the world and turned to the adventurous legends of Sinbad from the Arabian classic The Thousand and One Nights. 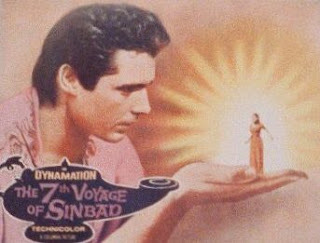 Last night, to help celebrate the seventh anniversary of the San Rafael Film Center, Harryhausen introduced a restored print of The 7th Voyage of Sinbad, which—with all due deference to Ingmar Bergman—is the greatest movie with 7 in the title! The screening was also in conjunction with the recent Billboard Books publication of The Art of Ray Harryhausen, written by Harryhausen and Tony Dalton, foreword by Peter Jackson. The Art of Ray Harryhausen is rich with stunning examples of Harryhausen's preproduction panels, which served to secure funding for his films as well as to inspire and motivate the studio writers. Joining Harryhausen on stage for a pre-screening discussion were Craig Barron, Arnold Kunert and Phil Tippett. 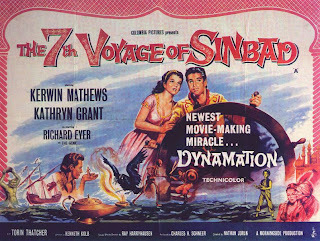 Tippett credits The 7th Voyage of Sinbad with being the specific film that kickstarted his career in special effects. Craig Barron moderated the discussion via a slideshow of key illustrations from the book of characters in the film, beginning with the Cyclops. The one-eyed, one-horned Cyclops of The 7th Voyage of Sinbad was Harryhausen's direct response against the man-in-the-Godzilla-suit style of special effects. He wanted to create a creature that clearly could not be a man in costume. Recycled from the armature of the Ymir from 20 Million Miles to Earth, the Cyclops strove for a representation far away from the easy notion of pasting an eye on the forehead of an Italian wrestler. Not many people notice that the second Cyclops that appears in the movie has two horns on his head. 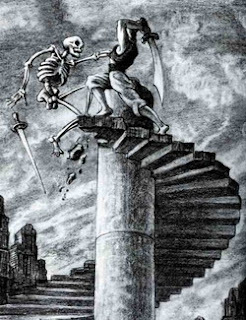 The cover of the new book is Harryhausen's concept drawing of Sinbad fighting a skeleton on the top of a ruined spiral staircase. Initially, Harryhausen's choice of Sinbad was almost incidental; it was the skeleton that he wanted to animate. Pursuing that choice, however, forced Harryhausen to ask himself the question most people seldom ask: How do you kill Death? In The 7th Voyage of Sinbad the skeleton falls from the spiral staircase and his bones shatter on the rocks. In Jason and the Argonauts the skeletons plummet into the sea on the presumption that skeletons can't swim. As a Mayanist, I can only ponder the possibilities had Harryhausen explored the Mayan epic The Popol Vuh where the realm of death is harrowed and Death defeated by the clever intelligence of the Hero Twins. Surprisingly, British censors cut out the swordfight between Sinbad and the skeleton as well as the scene where the Cyclops is roasting one of the sailors on a spit, allegedly for being too frightening for children. Harryhausen doesn't understand that reasoning since, nowadays, there are things in movies that would "frighten the devil"! Besides, every child carries a little skeleton around inside of him or her so what's the big deal? As a special treat for his San Rafael Film Center audience, Harryhausen shared his model of the skeleton from The 7th Voyage of Sinbad. He demonstrated its ball and joint armature and how it could be manipulated into any position. He used the model again—along with six new ones—for the fight sequence in Jason and the Argonauts. He expressed his hope that seeing the small size of the model didn't disillusion anyone. He was a notorious "people shrinker" who would make his actors small to match the proportions of his models. The next character in the slide show was the "snakewoman", one of Harryhausen's favorite characters in the film. 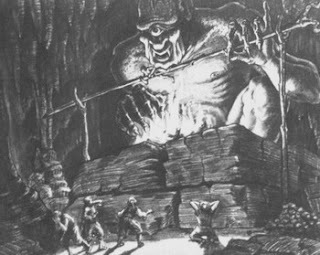 "I had always wanted to add a character at that point in the story who was not only completely different from the dancing girls with diamonds in their navels that feature in most costume adventures," Harryhausen writes, "but who would also show the magical powers of [the magician] Sokourah. The snakewoman is conjured up by the sorcerer to perform a dance of death when he 'combines' Princess Parisa's handmaiden with a serpent. Her upper torso is that of a human female with the addition of an extra pair of arms, but the remainder of her body is that of a snake. I decided to give her four arms so that I could elaborate the snakewoman's dance; with just two arms the creature might have seemed a bit mundane, but the extra pair of arms enabled me to give her whole body an allure and a flow that worked wonderfully with the music." (2006:163) Initially, to animate the model, Harryhausen used the music from the film Salome (1953), loaned by Columbia's music library, as a guide that provided a beat; later, of course, "Bernie" Hermann wrote a wonderful new score that fitted perfectly with Harryhausen's animation. Harryhausen concedes that the snakewoman was a precursor of the incredible Medusa in his later venture The Clash of the Titans. What did Harryhausen think of Peter Jackson's remake of King Kong? Some things worked for him, others didn't, but above all he states you can't criticize Jackson's point of view. The primary difference for Harryhausen between the original and the remake was Merian C. Cooper whose infectious vitality infused the character of Carl Denham in the original. Cooper was Denham! And there was no way Jackson could have replicated that. One of the highlights of Harryhausen's life was to work with Merian C. Cooper on Mighty Joe Young. Cooper taught Harryhausen about "the wonderful valley of what if?" Harryhausen praised Wilkie Cooper's cinematography for The 7th Voyage of Sinbad. The film was made on the miniscule budget of $650,000. To light the scene of the cave on the island of Colossa (Majorca), they had to borrow lamps, which en route fell overboard and sank to the bottom of the sea. It is to Cooper's credit that he was able to light the cave with so little and have it look so fantastic. Another interesting tidbit about The 7th Voyage of Sinbad is that Ray Harryhausen has never met Richard Eyer, who played Baronni, the genie in the lamp. All of Eyer's scenes were shot in the U.S. when Harryhausen was on location. Eyer has since become an elementary school teacher and he and Harryhausen will finally meet for the first time in a couple of weeks at a special Burbank screening. Before the screening of The 7th Voyage of Sinbad, Arnold Kunert recalled how, at an earlier appearance at the San Rafael Film Center (Harryhausen has graced their stage four times), Harryhausen admitted that one of his few regrets was not animating the tales of Edgar Allen Poe. Kunert pursued the idea and found a group of stop action animators in Toronto willing to undertake the project. Serving as the project's executive producer, Harryhausen has come somewhat out of retirement to help them accomplish their goal. Kunert was delighted to introduce the West Coast premiere of The Pit and the Pendulum, directed by Marc Lougee, who is likewise maintaining a blog on the film. This eight-minute short will be screened at this Fall's Toronto Film Festival in hopes of securing the backing for a continued series. During the Q&A Harryhausen was asked what he thought about the Wallace and Grommit films. Harryhausen stated that, even though they were using the same basic process, Wallace and Grommit are "stylized puppet films" whereas he always sought to disguise such puppetry and make his creatures as realistic and believable as possible. Asked which of his animations were the most difficult, Harryhausen stated that it took him four and a half months to animate the skeleton battle sequence in Jason and the Argonauts. Four and a half months for five minutes footage! Had he known it was going to be so difficult, he probably would never have started. The seven heads of the Hydra were also challenging to achieve. All it took was one phone call interrupting the process to throw everything off! Asked how he was able to make his monsters so sympathetic so that audiences actually mourned their deaths, Harryhausen reminded that he never called his animations "monsters"; they were "creatures." Clearly, his humanoid creatures elicited more sympathy; but, ultimately, they were the villains and had to be vanquished and/or killed. He remembers being told, however, that when the creature in Beast From 20,000 Fathoms died it was like watching an opera tenor. Asked if any of his animations had been cut in the editing room, Harryhausen conceded to scenes being trimmed for length. There was one bit in the skeleton fight sequence of Jason and the Argonauts that was cut out because it interrupted the flow: and that was of the skeleton Jason beheads who then falls down on his hands and knees groping and searching for his head. It proved distracting. Harryhausen admits to having a Zeus complex. He likes manipulating his figures like chess pieces on a board. It seemed a bit unfair to subject Harryhausen to questions when he admittedly forgets the answers. He credits fish oil for any memory he has left and his quick retort to most questions is "It's in the book!!" Great reportage, Michael. Wish I could have been there the other night. I saw Seventh Voyage of Sinbad for the first time a couple years ago when it was one of th elast films to play the Auctions By The Bay theatre in Alameda (the other was 20 Million Miles to Earth, both in great prints). What a wonderful showcase for Harryhausen's gifts (not to mention Bernard Herrmann's). But I may have to draw the line at agreeing with your "7 in the title" claim; it's not Bergman I'm so concerned about but Kurowsawa. Actually, just to be clear, that "claim" really isn't mine; I was repeating what the dude who introduced the panel said. I'm sure there's a whole queue of movies with 7 in the title ready to take me on. Thanks to Girish and Dave Hudson at the Greencine Daily for picking up this entry! Wow, terrific article! I don't know which I am more stunned by...the fact that someone really cares enough to write about an event and book about Harryhausen, or that said article mentions in the same sentence an old high school english teacher, Arnold Kunert, and some guy who went to Palomar College in San Marcos that I met in the "Timber Room", Phil Tippet...heheh. Seriously though, thanks for having shared this, it's good compelling writing on an interesting subject. Edward, thank you so much for stopping by to comment, especially on an entry that's already been sitting on the shelf for over a year. It's heartening to know they survive once they've rolled off the front page. Further, you motivated me to finally attach the graphics I've been meaning to add for months now. Thanks for the impetus. Finally, it's interesting to hear of your personal connections to both Kunert and Tippett. What was Kunert like as an instructor? And any anecdotes on Tippett you'd care to share? has left an indelible mark on me ever since! Dont buy the overly expensive Sarabande CD issue if available still, for it is missing fourty five seconds of the overture, though it is a stereo recording. The vinyl version is intact. Thanks for a good report. Anon, thanks for stopping by to comment. Like yourself, I can watch Harryhausen films over and over and over without them ever losing their appeal. Thank you also for the informed advice on the soundtrack. My best.